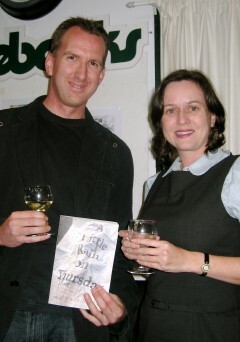 The launch of A Little Rain on Thursday at Gleebooks last week went very well. Delia Falconer said some very kind things about the book and there was a great crowd there, so thank you very much if you were part of it. That’s me looking pleased with myself, Delia looking indulgent and the book looking as wonderful as ever (if a little flashed out). I realise it is a stretch, but imagine The Da Vinci Code with brains. No, that’s not fair: it obviously takes brains of a kind to top best-seller lists for several years. So try thinking of how a serious intellect, as distinct from a facility for page-turning compulsiveness, might have gone to work on it. Such effort won’t tell you all you need to know about Matt Rubinstein’s new novel, but A Little Rain on Thursday is inter alia about old manuscripts, church history, subterranean chambers, Templars and libraries – and it is compulsive reading. Shucks! I mean, I’m always bit ambivalent about comparisons to Dan Brown’s book, but I’m not going to complain if they’re all like that. The review also draws in AS Byatt, Michelangelo Antonioni and Peter Carey, which I absolutely love. Matt Rubinstein’s new novel, A Little Rain on Thursday, seems like many books rolled into one: it’s a mystery, a novel of ideas, a meditation on faith, grief, love and the quest for knowledge – and it’s a rollicking page-turner. I’d sure buy a book like that—wouldn’t you? Hey Matt, the cover looks fantastic. Great to see your book at the airport bookstores and my local angus & robertson. Finally you have the success you deserve.